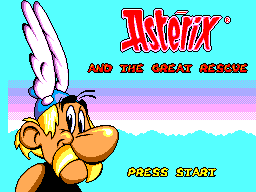 Asterix and the Great Rescue is a platforming game developed by Core Design and published by Sega in 1994 for the Sega Master System (Europe and Brazil only) and Sega Game Gear. It is different from the Mega Drive game of the same name, however has the same plot. This game is a more traditional play-all-the-levels-in-order platformer. You start out as Asterix, but can switch between Asterix and Obelix by pressing + . Asterix may move while crouching by holding and a direction. jumps, punches. Should a weapon bag be found, shoots the weapon, and only the character who found the weapon can use it. Main article: Astérix and the Great Rescue (8-bit)/Magazine articles.